Heavy Duty Black Bin Liners Pack of 200 bin liners .. 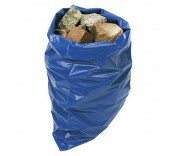 Heavy Duty Rubble Sacks. Ideal for heavy duty rubble and refuse. 500mm (W) x 750mm (H.. Swing Bin Liners Pack of 100 liners .. The external bag to be used in the removal of hazardous abestos material. To be used in conjunc.. The internal bag to be used when removing hazardous asbestos material. To be used in conjunctio..